All of us experience stress in our daily lives. This can affect the human immune system, leading to illnesses both on Earth and in space. Many astronauts return from missions in poor health due to the harsh conditions endured over prolonged periods in space. On Earth, healthy and critically ill people, in particular, suffer from similar ailments caused by the same stress factors, having a considerable socioeconomic impact. In 2015, the economic losses caused by the incapacity to work – often due to mental illness – amounted to 113 billion euro for Germany alone. ##markend##In order to better understand stress-related illnesses and help scientists develop effective countermeasures, the Immuno-2 experiment on the International Space Station (ISS) is examining microgravity, radiation, isolation, heavy workloads and disruption of sleep rhythms as stress factors affecting the immune system. Combining biochemical analysis with psychological tests, astronauts will provide blood, saliva and hair samples to assess their hormone and stress levels before, during and after their missions. They will also undergo electroencephalography (EEG) tests to monitor brain activity. The ISS provides a unique testing ground where all of these stress factors coincide in a one-of-a-kind laboratory. 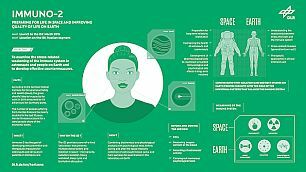 By comparing the results in space with those of isolation and bed-rest studies conducted on Earth, scientists will gain further insights into the individual factors that balance the immune system and help prepare astronauts for long-term missions in a way that will protect their health. It will also help doctors to refine treatments for stress-related illnesses such as 'burnout' and develop therapeutic measures in clinical intensive-care units, where patients' immune systems are more susceptible to infection. Immuno-2, one of 41 German experiments conducted on the ISS as part of the horizons 2018 mission, is contributing to three of the United Nations’ Sustainable Development Goals: Good Health and Well-Being (3), Decent Work and Economic Growth (8) and Industry, Innovation and Infrastructure (9). The goals are included in the 2030 Agenda for Sustainable Development adopted by the United Nations in 2015 as an action plan for people, planet and prosperity.